Susan combines practical experience from leading successful strategy design and transformational change in complex organisations like NAB, Telstra, Woolworths, Energex, and state and local government, with the use of leading research and frameworks to help you review your business performance and undertake change. She has worked with organisations across the finance, energy, ICT, FMCG, government and not-for-profit sectors and engages people at all levels in strategy development and implementation in ways that deliver sustainable results. Susan was part of the leadership team for the design and start-up of the award-winning Service NSW that has successfully transformed NSW Government transactional service delivery across digital, phone and service centre channels. 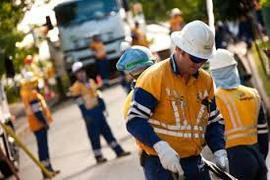 Service NSW was opened in 6 months with customer satisfaction lifting from 60% to 98% and top quartile staff engagement. She brings this experience in transformational service improvement to your organisation. Susan has developed people and workforce strategies in the business, government and not-for-profit sectors to support business strategy. This has included a multi-year people and workforce strategy and performance improvement program that reshaped a top 100 company and transformed the relationship between leaders and staff, delivered top quartile staff engagement, and reduced price increases to customers. Susan designed and facilitated a process that engaged staff in a newly merged organisation to identify priorities to create a successfully merged organisation that would deliver greater value to the community and be a great place to work. This shaped the development of the new corporate strategy focused on delivering improved value to the community, better organisational performance and high staff engagement. Susan worked with leaders and staff from a range of councils to assist with strategy development for the formation of new amalgamated councils and engagement of staff in shaping improved working relationships with councillors and improving service delivery to communities. Susan worked with a regional Council on a culture diagnostic and facilitation of conversations involving one third of staff across Council and the executive to improve staff engagement, performance and communications within Council. Susan has broad and deep experience in organisational design and restructuring in organsations of all sizes. She has restructured whole organisations, divisions and teams and has recruited individuals and executive teams. Susan has established, reshaped and led multi-functional HR teams and services in many government and private enterprise organisations to improve service standards and deliver business results. This has including introducing systems, process and skills that lifted customer satisfaction to >90%. She is experienced in all aspects of human resources including workforce strategy, organisation design and restructuring, workforce planning, organsation development, recruitment, and HR policies, process and systems. Susan has led a range of state-wide functions in National Australia Bank including HR, business strategy, branch productivity, sales and culture change initiatives. This, combined with experience as an Area Sales Manager, adds practical commercial experience in understanding and running a financial services business with 270 outlets generating $290M profit. Susan created and delivered a world-first customer-focused wireless workplace solution & culture transformation at Telstra Mobiles & led the concept design for a Telstra Digital Innovation Centre. Susan led a major program of 200 business performance improvement initiatives in the Woolworths' Corporate Refresh Program supporting delivery of $80M per annum savings and reductions in the cost of doing business. Some of the organisations that have engaged Susan as an executive or a consultant.